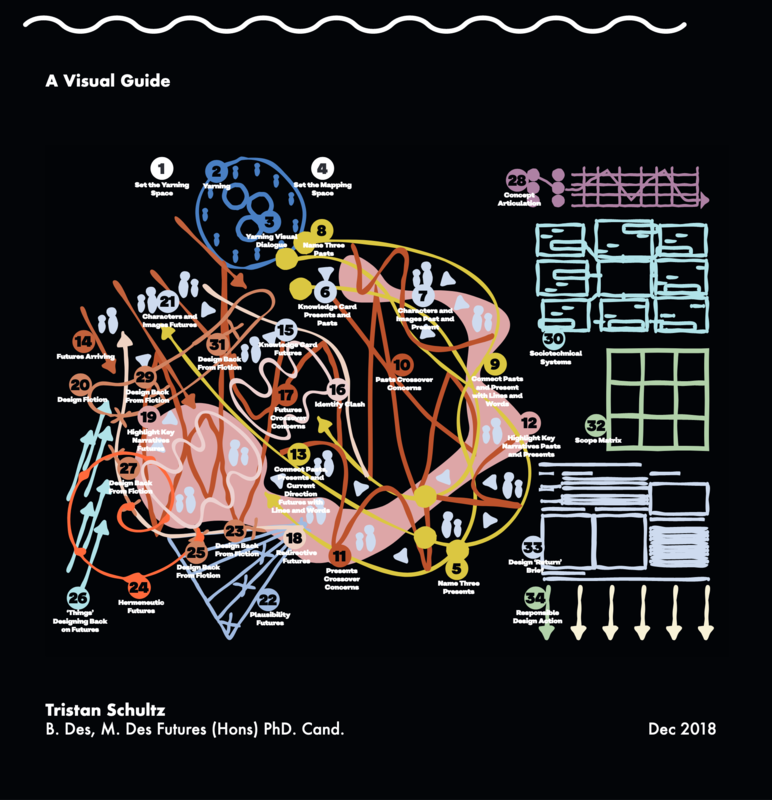 This Critical Mapping as an Articulatory Design Practice Visual Guide is written and designed by Tristan Schultz. It has been compiled as a guide for designers, activists, organisers and others wishing to utilise a loose methodology that might help them map out their concerns with decolonising and future-oriented perspectives. The guide features participatory, speculative, strategic, creative and design thinking tactics combined in an order that have been effective in encouraging transformative conversations and radical ideas. There are over 30 possible steps featured, however these do not all need to be undertaken. Some can be skipped or amalgamated for shorter engagements. For example, a few steps repeat to placehold the greatest iterative process possible, but some of these repetitive steps might be considered as one. Each page has four sections: the step as it relates to the overall maps steps, theories, practical steps and resources/ tools. Each page therefore has enough information to be read in isolation so it can be recombined with other step sequences. The visual growth of the map template on each page is deliberately messy and relational to encourage the same engagement. Theories, practical steps and more information are included in each step. A Visual Templates Appendix is also provided to explore, follow and hack loosely and liberally. These experimental methodologies have worked for me, in my contexts with my own bodily and identity politics inevitably at play. I will continue to iterate and explore their efficacy. I offer this guide simply as a gesture in solidarity with other socially engaged politically active individuals in the hope that, autonomous from my presence as facilitator, they might find ways of reconcieving these steps usefully in their worlds too. B. Des, M.Des Futures (Hons), Phd.